Well as you know we have been offsite at the Nightfall astronomy festival in Borrego Springs. The location has very dark skies and is about a 2.5 hours drive outside of Orange County. We had three good nights of observing and it was a lot of fun and I have four photos to share. parking lot for about 60 RV's, which is where some of the folks also set up their scopes. The second photo shows one of the large metallic creatures we found in the desert area. This and many, many others are the product of the mind and hands of local sculptor Ricardo Breceda. His sculptures are all over the area and show up all over the Anza Borrego desert. Finally, I took aim at Andromeda again and hoped to finally get a good shot of the spiral galaxy in this dark sky location. Andromeda is too big to be seen in the telescope eyepiece so I mounted the camera piggy back on the telescope, which continues to track for the Earth's rotation. The camera lens was set to about 200 mm, which was a trade off in having a wide enough field of view so that I could get M31 in the shot and account for any misalignment between the telescope line of sight and the piggy back mounted camera line of sight. 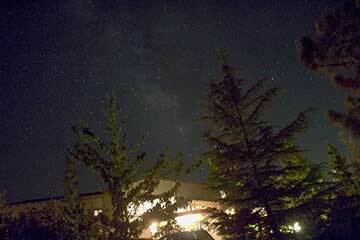 Yes, finally, I got a good shot showing more detail than I could get in not so dark sky locations. I settled on a 2 minute exposure to bring out some of the spiral nature. I think that even little satellite Galaxy M32 is also visible just above M31 also. I tried going to 4 minute exposures, but my camera noise and telescope tracking noise caused more of a washed out appearance. I should recount for all the new amateurs again, about a painful lesson learned, which, I had already learned, came back to haunt me. For about 5 minutes, as I tried to align the camera view with the telescope view of a bright star, which was in the telescope eyepiece, I couldn't see anything on the camera live view screen. Had I forgotten to take the lens cap off? I couldn't really see if it was off because it was dark and the camera was mounted high on the scope. I didn't want to feel the end of the lens and get my fingerprints all over but I finally had no choice. Yep, sure enough the lens cap was still there. I thought I had already learned that lesson and here it was time to go through that again. Finally, during the plenary session in the outdoor amphitheater, all of the amateur astronomers were shocked to see a green glow in the distant sky. We were all facing east, when someone noticed the green glow to the west. What was going on to cause that bright sky glow? I gabbed my only available camera and took this final shot, so just in case you didn't see it live or one TV. The glow kept growing in size and eventually over several minutes started to fade from view. It was only later in the evening that we learned it was caused by a navy missile test off the coast of Pt. Magu in California. So it was a fun time all around and we are definitely planing to come back to Borrego Springs for some good dark sky observing where you also have all the comforts of home very close by. I got a email, about 3:15 in the morning, from Searching for Gravity Waves Gary, reminding me that he was up and about back east and he saw that the moon had joined the triple planet alignment and that I should get up in the morning and take a look. So, what am I supposed to do? We observe all night and now are we supposed to get up early in the morning too? Ok, ok, I get it Gary. Thanks a lot for the heads up. Now, I meant to get up and see the sights, but I was exhausted and just overslept. Maybe some of you can do your part and get up early and take a look. I'll try to get up in tomorrow morning and take a look, but for now it's time for the resident astronomers to return to their permanent observatory location.